GAINESVILLE, Fla — There is a lot for the Florida High School Athletic Association (FHSAA) to be proud of these days. Increased revenue and attendance from some of its major state championships, finding new ways to get creative with sponsors, launching a new playoff format for tackle football and most importantly, seeing growth increases in some of its sanctioned and sponsored sports. One of the sports that continues to see growth is Girls Flag Football, which will officially kickoff the regular season next Monday. For most schools that sponsor a team finds many benefits to having the sport as part of its overall sports roster. That includes nice participation from female student-athletes at school, sometimes outgaining participation in more traditional sports like softball, having available equipment already on-site thanks to tackle football and most importantly, the costs are low. According, to most Flag Football coaches we have spoken to they usually spend on average of $500 per year for their team. Most of that goes simply into uniforms and other miscellaneous equipment that is needed and nothing more. However, just don’t look at the growth of the sport as a way to help balance things out for Title IX purposes although that is a big reason why more public high schools in recent years have added the sport. Instead, there are bigger goals ahead. Some of the bigger goals for the sport itself include seeing more states add the sport (NOTE: Nevada and Alaska also have Flag Football. However, Nevada considers Flag Football a winter sport and not a spring sport), plus eventually getting Flag Football recognized as an NCAA-sanctioned sport which would open up the door to more scholarship opportunities. 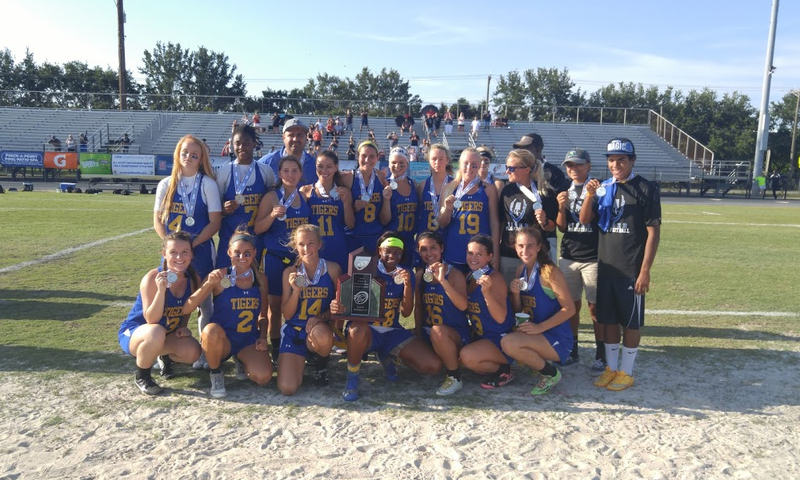 When we put Flag Football into our coverage rotation last year, we ran an article on some of the overall history of Girls Flag Football in Florida. Now is a good time to take a look at the growth part of the history and see how the bar keeps going up on the number of teams are participating in the sport. As we had it last year, we have been able to expand the line chart showing the growth over the years for the FHSAA. While the number of teams didn’t increase much for teams in the state series, there are new schools this year that are giving flag football a go on the schedule. According to the FHSAA’s website, as shown in the chart above, 230 teams are assigned to a district for this season, while over 30 more confirmed teams have been verified to be playing some sort of independnet schedule. Areas that are joining into the sport this season include schools in the Pensacola-area (Escambia, Pensacola, Tate, Pensacola Washington and Pine Forest), Manatee County schools (Manatee, Braden River, Southeast, Palmetto, Lakewood Ranch and Bayshore) as well as schools in areas where there is more concentration of Flag Football teams like Madison County and Bradford. Leesburg High would have also added the sport this year, but according to sources close to the school, the Lake County School District is investigating to add the sport in 2017-2018 at all eight of its high schools instead. The potential addition of those eight schools would give the Orlando-area a boost and would fill in an area where there is currenlty no Flag Football teams. As such, that would leave areas like Lake City, Gainesville, Southwest Florida and Brevard County as the biggest areas to fill in with girls flag football. It should only be a matter of time before those areas will eventually join in and join the growth a sport that has proven to be highly popular with female student-athletes across the state. In the end though, the future for girls flag football is remains very bright for the years ahead.